Over the next few days I am going to share with you all about this past weekends wedding in Lehigh Valley and all about the details. 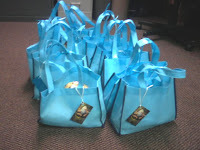 I put together the out of town gift bags. They were earth friendly fabric bags I purchased at Papermart. Inside was lots of goodies: pretzles, granola bars, bottled water, an apple. As well as shout wipes, advil packs, tissues, golf tees, Hershey's Kisses and mouthwash. For the hang tags I used their engagement picture and had moo print them. I also had special key cards made with the couples engagement picture on them. This was a first for Hotel Bethlehem. The guests were so excited and kept talking about how cool this was. The customized key card was an awesome idea! You go girl.